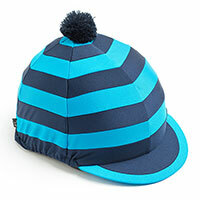 Jazz up your cross country kit with this awesome Navy & Blue Striped Hat Cover. Be bold and make these your next seasons XC colours. Why not try a pair of our Navy Competition gloves to match?